This week I went over to my friend Annalee’s house to teach her this amazingly delicious and super easy recipe. Annalee is a makeup artist & vlogger from New Plymouth, her kitchen is honestly heaven! It makes me so excited to build our house and my dream kitchen! 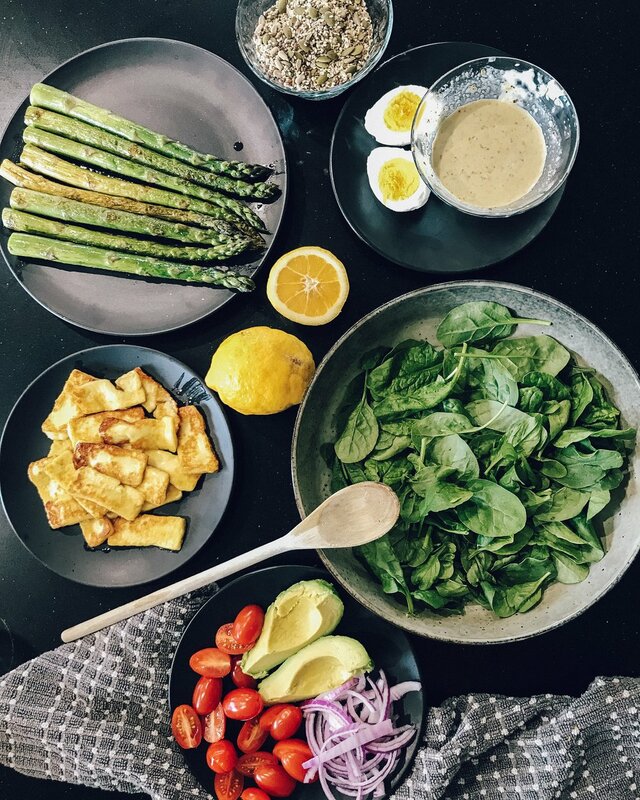 Asparagus is still in season, and so is avocado - and I’m pretty sure halloumi is Annalee’s favourite food, so, match made in heaven! Heat a pan over medium heat with a drizzle of olive oil and 1 heaped tsp butter, when heated, add in slices of halloumi cut approx 1/2 cm thick. Pan fry until browned on each side - watch while it cooks as it will burn easily. Add a little more oil and butter to the pan in order to pan fry your asparagus. Fry for approx 3-4 minutes. Should be nice and crunchy. Season well. Hard boil your eggs in boiling water for 10 mins and then put in cold water to cool. Once everything is cooked, lay a bed of spinach in a bowl and then add in all of your other ingredients on top.